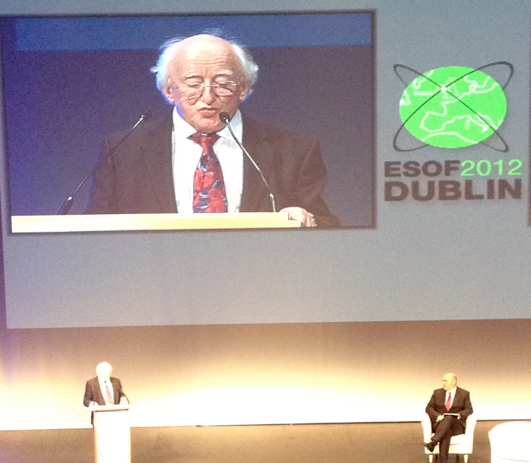 I’m in Dublin as a delegate at something called the Euroscience Open Forum. To me, it is a science festival, but in typical European style, it has a rather strange name. It consists of a series of talks, discussions, debates, workshops, plays, poetry readings and much else besides, covering all areas of science, from my own area, physics, to subjects I know next to nothing about (most of medicine, for example). This means I have the chance to join in with my favourite areas, where I might be able to jump up and join in the debates from a position of knowledge, as well as to learn some new things. Things kick off properly tomorrow, with today having featured registration, a reception late in the afternoon, and a welcome session. This meant I had time to wander round Dublin, somewhere I’ve never been before, and wander around looking at the city, and stopping in at least one of Dublin’s famous pubs for a pint of Guinness. The festival is taking place mostly within an enormous convention centre, newly built in the Dockland part of Dublin. Mostly, when I go to science conferences, they take place Universities, or small self-contained hotels with conference facilities. The scale of this is something else, and so is the organisation, with many convention centre staff around to shepherd you / check that you are allowed to be there / stop you walking places you aren’t. It certainly gives it a less friendly feeling than most conferences I go to, but I suppose the constituency is much larger and diverse here. The opening welcome session was quite enjoyable. It was hosted by Dara Ó Briain, the comedian, presenter, and pro-science good-guy, and talks were given by a range of dignitaries, starting with the Irish President, Michael Higgins. I enjoyed his talk very much, talking as he did about science as part of human endeavour, placing it in a wider context. He highlighting Irish scientific success, pointing out that the Irish might tend to highlight their literary heritage more than science. He mentioned Walton – Ireland’s Nobel-Prize-winning physicist, and also Bell’s inequalities. These are quite a specialist thing, and it’s impressive that he knows about them. It was curious, though, that as a representative of the ROI government he spoke of the achievement of a Northern Irish scientist, whose education and career was in the UK then elsewhere in Europe and the US as being an Irish success. I don’t know that much about Bell’s life, though, and maybe he always considered himself as Irish. Anyway, it was a very good speech, and he mentioned also the line “we are made of stardust,” being used by Jocelyn Bell Burnell later in the week, and suggested that the line was taken from a poem of his (he’s a poet as well as president). I had always heard that it originated with Carl Sagan, so there is something else I have learnt, or at least need to investigate further. He also mentioned how he thought scientists should concern themselves with political issues, as well as the science itself, mentioning the issue of escalating food prices in Africa caused by an increase in speculation on the future price of food. The picture above shows a poor shot of the president, taken with my phone, with Dara Ó Briain hosting. The next speaker, Patrick Cunningham, was the leader of the team running the ESOF2012 festival in Dublin, as well as the Irish chief scientific advisor. I thought he spoke well, but it a rather civil service sort of way, talking about the need to ensure that publicly-funded science have outcomes of benefit to society, as well as allowing looking up at the stars. I was just a little uneasy that he meant that each research activity had individually to demonstrate "impact" not that we could have a diverse research ecosystem with the fundamental areas doing their part to stimulate future young scientists, and future applied research amongst the existing applied research. It seemed a careful politician’s speech. The next speaker, Enric Banda, was much more enthused with the positive nature of science research, mentioning how we should be trying to enthuse the next generation, how use of the word Austerity should not mean cutting essential activity and that science research is an essential activity. We can certainly argue about that one. His heart was clearly much more pro-science, but he was backing it up with evidence about how those economies with strong research and innovation had the ability to weather the economic storm later. Then there were two more speakers, also interesting and entertaining, but my word count is getting longer and longer here, and I want to finish planning what to attend tomorrow. It’ll be a long day, starting at 8, with my hotel an hour by bus from the conference venue, so I’d best get to it. I think I will go to the keynote addresses by Mary Robinson and James Watson, but apart from that, not entirely sure.